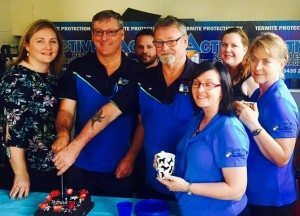 Active Pest Management – locally known as the Pesties in Blue – have now won their third Business Excellence Award in 2017. Two are in the Ballina Coast & Hinterland sector and most recently, they are delighted to be announced the overall Northern Rivers Regional Business Excellence Award Winner in their category of Trades & Manufacturing. No one could accuse Active Pest Management of being a wallflower business. They are front and centre on the Northern Rivers’ business landscape and continue to dial up the volume on their ‘Pesties in Blue’ branding so you can’t miss them. Sponsors TAFE NSW presented the award to Active Pest Management by the Northern Rivers NSW Business Chamber at a gala evening held at Elements of Byron Resort, Byron Bay. This recent win, beating out five other competitors, on top of previous wins in 2013 and 2016, signals the ‘Pesties in Blue’ have come a long way from humble beginnings seven years ago. “We didn’t expect this. It’s heartening to receive this regional award, because it means all the hard work put in by ourselves and our staff is being recognised, not just where our business is based in Ballina, but across our entire service area and it’s paying off,” says Tony Dunn of the award , Active Pest co-owner/manager and pre-construction termite management specialist. “It shows us we are actually heading a long way toward succeeding at what we set out to do, which is to be the best in the business, for the benefit of our customers and our team.” adds Jim Burgess, other half of the co-owner/manager duo and well-known pest expert. This year has presented numerous challenges for the Active Pest team, including an excessively wet summer, followed by a mild but extremely dry winter. Add to those factors the fast-evolving science of non-chemical pest management and bio-compounds targeting specific pests, it’s easy to understand there are plenty of industry specific trends to keep abreast of against the background of an increasingly pressured economy. As Tony alluded to in his acceptance speech at the 2017 NSW Business Chamber Award ceremony, “What many people wouldn’t be aware of outside the industry is that several well-known national pest control brands have been taken over by international companies, taking profits off-shore. “We are finding customers are more than happy to support local businesses, which is reassuring for us in this highly competitive industry. That’s why it’s vitally important we differentiate our business with strong marketing messages that educate and inform customers about who we are, where we’re from and what we offer,” says Tony. 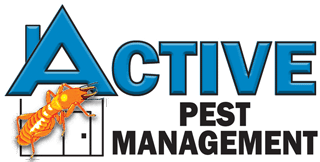 “To stay ahead in the pest control field, we need to run a tight ship and stay informed of industry developments and legislation. At the same time, administrative practices and field technologies are continually upgrading at record pace. It is imperative to our continued success that we work on our business as much as work in it,” Jim asserts.